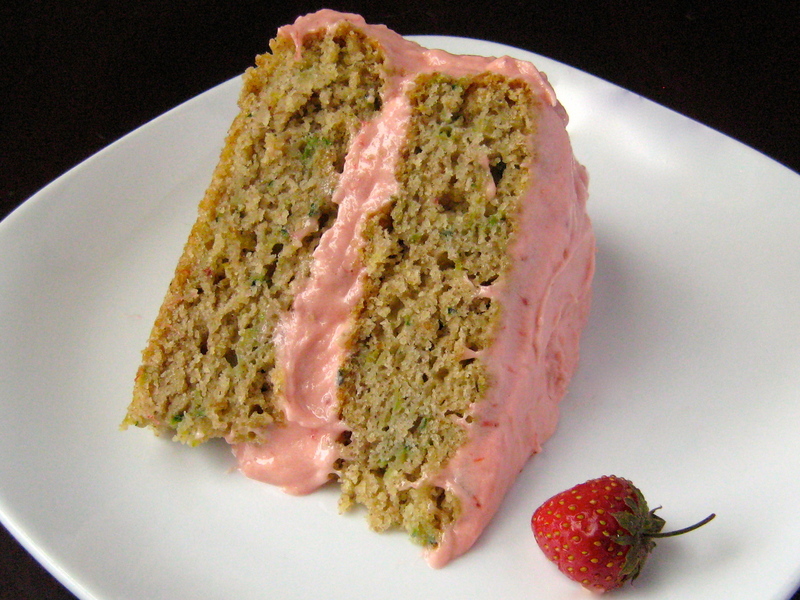 A gluten-free and vegan lemon-kissed moist, light zucchini cake, loaded with a rich strawberry buttercream. Summery and fresh, you can do double duty with the recipe and nix the frosting for a simple brunch cake that goes perfect with tea. To make the cake, preheat the oven to 350 degrees F. Lightly oil two 8-inch round baking pans, line them with parchment paper, and lightly oil the parchment paper. Put the nondairy milk in a bowl or measuring cup. Add the cider vinegar and let stand until the mixture is curdled, about 3 minutes. Put the sugar, oil, brown sugar, flaxseeds, vanilla extract, and curdled milk mixture in the bowl of a stand mixer or a large bowl. Turn the mixer or a hand-mixer on medium high speed and beat until well mixed and emulsified. Put the sorghum flour, millet flour, tapioca flour, arrowroot flour, baking powder, xanthan gum, baking soda, and salt in a medium bowl. Whisk to combine. Stir in the lemon zest. Mix well. Turn the mixer to low speed. Add the flour mixture, about a third at a time, beating after each addition, until well mixed. Turn off the mixer. Stir in the zucchini by hand. Scrape the batter into the prepared pans using a spatula, smoothing evenly. Bake in the centre of the oven for 23 to 27 minutes, until a toothpick inserted in the centre of each cake comes out clean. The cakes will be golden brown, begin to pull away from the sides of the pans, and will spring back when lightly touched. Let the cakes cool in the pans for 10 minutes. Carefully remove the cakes from the pans and put them on a cooling rack. Let cool to room temperature before frosting. To make the frosting, put he strawberries in a small saucepan. Cook the strawberries on medium heat until softened, then mash to a puree. Turn heat to low, then continue to cook for about 20 minutes, stirring occasionally, until the mixture has reduced to about 1/3 cup (80mL). Let cool completely. Put the vegan buttery spread in the stand mixer or large bowl. Using the stand mixer or hand mixer, beat on medium-high speed until the buttery spread is fluffy and smooth, about 3 minutes. Turn the mixer to low speed. Add 1 cup (240mL) of the icing sugar, 2 tablespoons of the strawberry puree, and the vanilla extract. Beat until well combined. Alternately add the remaining icing sugar and remaining strawberry puree, beating until smooth. Once the mixtures are both added, turn the mixer to high speed and beat until creamy and fluffy, about 4 to 5 minutes, adding a little extra icing sugar if needed. To assemble the cake, carefully transfer one layer to a service dish. Spread a layer of frosting using a metal offset spatula over the top of the layer. Cover with the other layer, pressing down slightly. Spread the remaining frosting over the sides and top of the cake. Serve immediately let stand at room temperature or in the refrigerator before serving. Store leftovers at room temperature or in the refrigerator in a sealed container. Notes: It’s best here to use a nondairy milk such as coconut milk beverage (in the carton) or almond milk, as they are fattier and richer, producing a more tender cake. When measuring the flour, spoon the flour into the measuring cups, then level the top with a flat edge for optimal results.